A 6 foot Halloween inflatable scary black widow spider with the reddish orange markings and 8 long super creepy legs. Its eye-catching pure white LED lights that make it perfect for a night time fright or maybe a bite! An eerie inflatable prop decoration that is sure to attract the trick-or-treaters! A great scary fast self-inflating yard, lawn or entryway indoor or outdoor holiday display that plugs into a standard 110v U.S. electrical outlet. 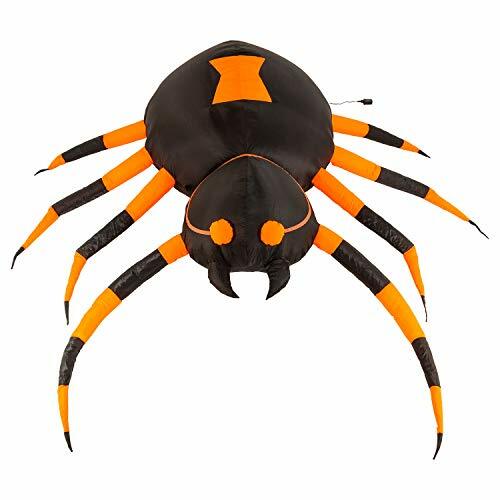 A 6 foot Halloween inflatable scary black widow spider with the redish orange markings and 8 long super creepy legs. Its eye-catching pure white LED lights that make it perfect for a night time fright or maybe a bite! An eerie inflatable prop decoration that is sure to attract the trick-or-treaters! Dimensions: 6 feet long. Made of waterproof polyester nylon fabric. Includes sandbags, stakes, tethers, and blower for a quick and easy setup.